The genre where FAR: Lone Sails belongs should have its own category. The only way to tell about it, is to give references of other games—which I hate to do. I tried to come up with a name for the category, but I couldn’t. Limbo, Journey, Inside are the closest games to reference with. I’ve played all these types of games that is out there and they are my ultimate favourite, although they might begin to look all the same. This particular game almost slipped through my fingers, and I would’ve never forgive myself for that. Video games are popping up so quickly that it’s hard to keep up with. Thankfully, I was provided copy of FAR: Lone Sails for review. The type of game FAR: Lone Sails is the ones with no straightforward intro or any other voice acting or text. The story is only told with visuals, background music and sound effects, that FAR: Lone Sails performs harmonically. Ultimately the story is for everyone’s own perception with mixture of situations that have clear indications which all understands. The story is about a person, or such, travelling with his locomotive–like contraption in a vast desert. He goes to a journey that raises up many questions about his world and why it is destroyed and is he all alone. The controls are the most simplest in this entire universe. Move, jump and grab. Optionally player can zoom in and out. Although the controls are simple, the gameplay is surprisingly various. The character goes on sideways only and travelling long distances with a locomotive that works by pressing huge red buttons. Along the way player needs to hit the brake and collect burnable items to make fuel. The locomotive gets upgrades that piece by piece helps the journey. Player also needs to go out of the machine and figure how to open paths and gates to proceed. They are little puzzles, but I wouldn’t say they are anyway difficult, which makes FAR: Lone Sails more of a walkthrough simulator-ish. The aspect of being sideways only makes it even more so, as it won’t give free 3D space to move in. I have to admit, though, that some of the puzzles were interesting and fun to solve. 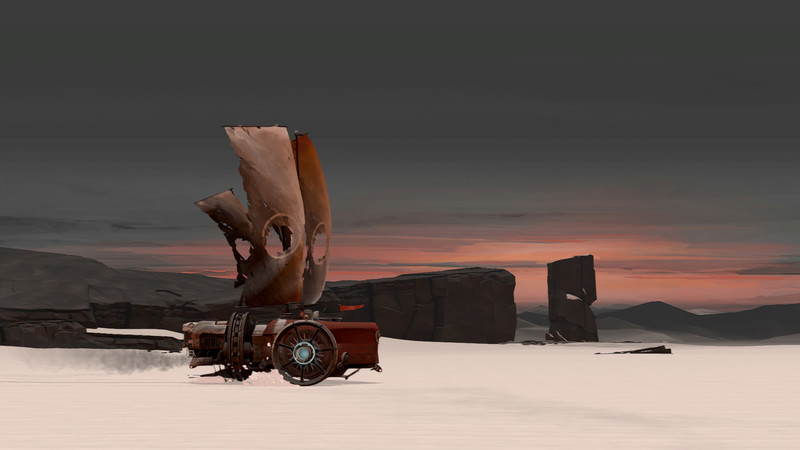 FAR: Lone Sails has pretty usual quality of graphics with painting-like textures, that gives oldish vibes. The colours are near black and grey, except red being shown in interactable objects, or randomly in the background. It helps a lot that the camera is zoomable in and out, but it wasn’t freely moveable, which wasn’t even needed. Overall FAR: Lone Sails have distinctive looks, succesfully made by using just a few features. With graphics being kinda simple and colours dull, the audio part have to be on point to fill the destroyed and empty world scenery. FAR: Lone Sails does perfectly with that, giving player the feeling of suspense by the background music, changing along the scenery and happenings. When travelling peacefully long distances I liked the easy piano playing in quietness. In sound part, FAR: Lone Sails hit the mark. As I mentioned FAR: Lone Sails feels more of walkthrough simulator, which are universally known to be easy. The puzzles were sometimes little tricky, but just a little. I think the most difficult was to keep the locomotive running since there were several things to do. Pressing the the gas button, releasing the pressure, hit the brake, rise/lower the sail, fixing or putting off a fire and other things that needed constant attention. This is yet another favourite game to my collection of games in this category, that is still unnamed. Story told without any text or voice acting is something I like and value. These kind of quiet pieces should come out only every no and then, so they won’t lose the magic, because it’s delightful to take a break from usual high visual and ear-shattering games and jump on to something like this. FAR: Lone Sails will give something unusual and relaxing and possibly something to deeply think about.